A turnover, penalties and the inability to make a stop on the final possession led to the Los Angeles Chargers third defeat by three points or less in the first four games of the 2017 season, a 26-24 loss to the Philadelphia Eagles on Sunday at StubHub Center. The Chargers pulled within two points on Philip Rivers 4-yard touchdown pass to Hunter Henry and Younghoe Koo’s extra point with six minutes, 44 seconds left. Philadelphia picked up four first downs on the ensuing drive, running out the clock, dropping the Chargers to 0-4, their first 0-4 start since 2003 when they lost their first five games en route to a 4-12 season. Just like a week earlier in a 24-10 loss to the Kansas City Chiefs, an early turnover by Rivers led to a touchdown for the opposition. Eagles reserve defensive end Chris Long, a son of Pro Football Hall of Fame defensive end Howie Long, sacked Rivers and stripped the ball from him, with Derek Barnett recovering for Philadelphia on its 32-yard line. The fumble was the game’s only turnover. The Chargers appeared to have forced a fourth-and-four play on Philadelphia’s 49-yard line when Casey Hayward stopped Trey Burton for no gain on a short pass, but the Eagles got a first down when Chargers outside linebacker Melvin Ingram was called for being offside. Philadelphia (3-1) increased its lead to 13-0 on 45- and 40-yard field goals by rookie Jake Elliott on their next two possessions. Rivers threw a 75-yard touchdown pass to Tyrell Williams on the Chargers first play after Elliott’s second field goal. Elliott kicked a 53-yard field goal on the Eagles next possession before a crowd announced at 25,374, including a large number of loud Eagles fans, many wearing the team’s green jerseys. Koo kicked a 28-yard field goal as the first half ended, cutting the deficit to 16-10. 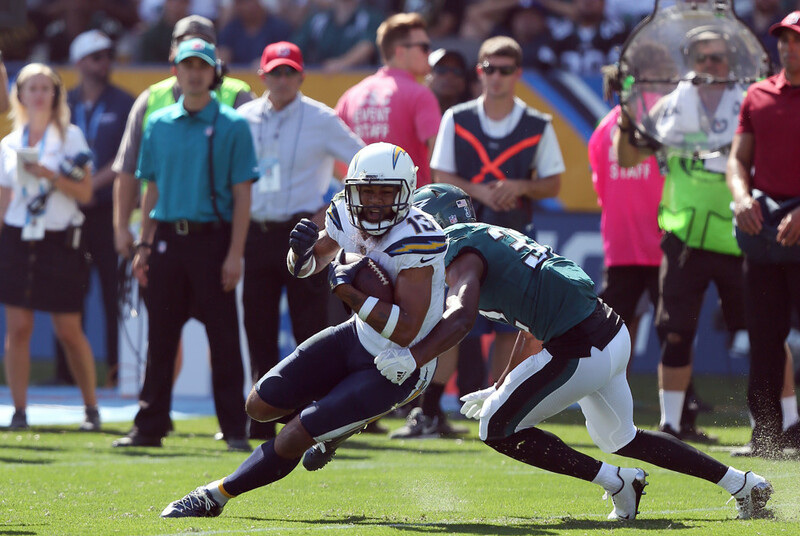 The Chargers had driven to Philadelphia’s 10-yard line, but Rivers short third-down pass intended for Keenan Allen was incomplete, prompting the field goal try. Elliott kicked a 47-yard field goal for the third quarter’s only points. The drive was extended when Wentz ran one yard to the Chargers 41-yard line on a fourth-and-one play. Rookie Austin Ekeler ran 35 yards for a touchdown on his first NFL carry on the ensuing series. Ekeler made the Chargers as an undrafted rookie free agent out of Western State Colorado University. The Eagles regained a nine-point lead on the ensuing possession on Wendell Smallwood’s 3-yard touchdown run. LeGarrette Blount ran 68 yards to the Chargers 3-yard line on the second play of the drive. Blount was stopped for no gain on a second-and-goal play from the 2-yard line, but the play was nullified by an offside penalty against Chargers defensive tackle Darius Philon. Cornerback Desmond King’s third-down sack of Wentz which would have forced a field goal attempt was nullified by an illegal use of hands penalty against Philon, giving Philadelphia an automatic first down. Smallwood scored three plays later. The Eagles outgained the Chargers 454 yards to 400 and led 26-18 in first downs and 39:18-20:42 in time of possession. Philadelphia entered the game leading the league in time of possession, averaging 34:12 per game. Rivers completed 22 of 38 passes for 347 yards and two touchdowns. Wentz completed 17 of 31 for 241 yards and one touchdown. Blount gained 136 yards on 16 carries.